I finally get to talk about the Russ tradition! I’ve been looking forward to this for a while, but now that I finally have some pictures, and have been able to talk to people about this, I feel that I still don’t really know enough to provide an adequate description of this tradition. I do, however, find this tradition amazingly fascinating. –From what I can tell, no other country has anything quite like this. Even Sweden and Denmark don’t have anything like this from what I’ve been told. But enough talk, I’ve hyped this up so much that the rest of this post probably won’t be able to match it. It is easiest to equate a Russ to a high school senior, although that’s not quite right. There are three categories of students at this level. First, there are those students in some sort of trade school who might become a mechanic, an electrician, or other blue collar jobs. Second, you have students who will become something the equivalent of white collar workers, but without going to college. –Some of these students might actually stick around for another year if they decide they do want to go to a university. Finally, you have the students who are preparing to go to college, and these are the students who will stick out the most during early May. In Norway, classes for seniors end around the end of April. May 1 is traditionally considered the start of the Russ season. Now, don’t get me wrong, there will be different events these students hold all during their final year, but it’s the end of classes when things really kick off. As I said, classes finish up around the end of A pril, but students still have to take exams, which start after Norway’s Constitution day (May 17). This means students have close to three weeks to study. Can you guess how much studying they seem to actually get done? Yeah, definitely not three weeks’ worth. Meet Mari, Hans Marius, Marius, and Kenneth. I met them while waiting to see the Star Trek movie (it started at 12:01 on Friday morning, making for a tough day at work later, I probably don’t need to tell you). Unfortunately I can’t tell you too much about these students individually, since we spent the time we had speaking about the traditions of this time of year. From the little time we had to speak, they seem like good people, and they were quite happy to tell me what it is to be Russ. 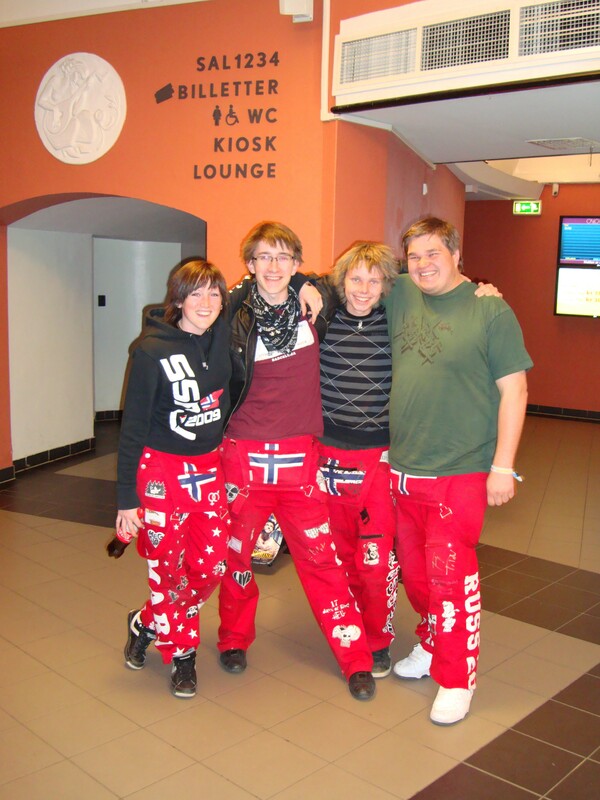 You will notice that they are all wearing similar pants, which is part of the tradition. 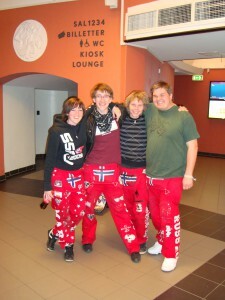 Red pants mean that they are in the third academic track I mentioned above, and they plan to attend a university. Students wear blue pants if they’re in the second group, and the students going to a trade school will wear black pants, if they participate at all. The students decorate their pants with iron on patches, writing, and many have their names on one of the legs, such as you can sort of see with Mari. Friends will often sign the pants as well. They will wear these pants from around May 1 (sometimes earlier) through the 17th. Every day. All day. And part of the tradition is that they don’t get washed. Another piece of the tradition are russekorter. The size of a business card, russekorter usually have a picture of the student, possibly some contact information, and a joke of some sort. The picture generally isn’t serious. It might be a baby picture or something that was taken at a party. The joke? From what I’ve seen, they’re usually pretty bad. If you’d like to see an example, take a look at this post, presumably by Ronja Røverdatter. Children often go around collecting these cards. 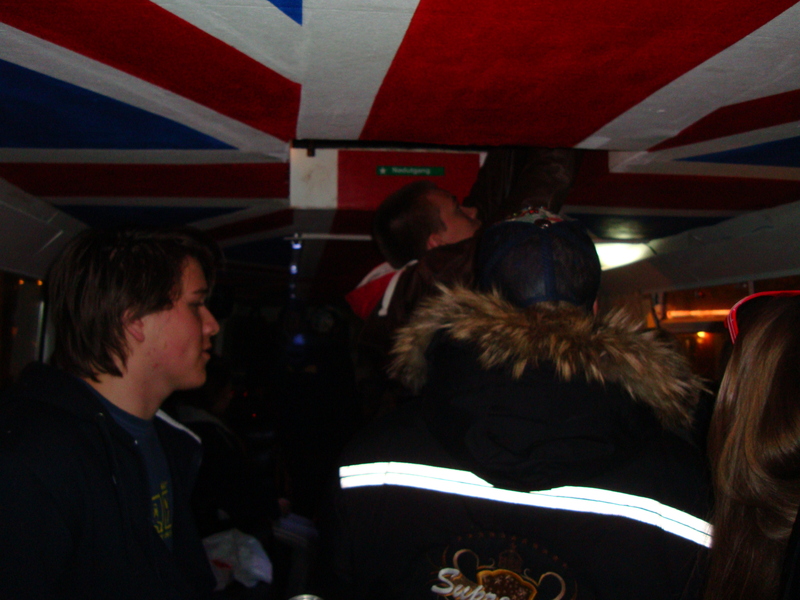 Finally – well, in regards to what I’m going to write about tonight – are the russebuser, the Russ buses. Traditionally students might drive around in a van with as large of a sound system they can afford and drive around drinking (not the driver, of course) all through the night. In the larger cities, especially in Oslo, they’ve taken this a step further. Some students will band together to buy a bus and outfit it with a sound system. Just in case you think I mistyped, I didn’t – they will actually buy a bus. Apparently this can cost in the range of a million kroner, or somewhere in the $200,000 range. 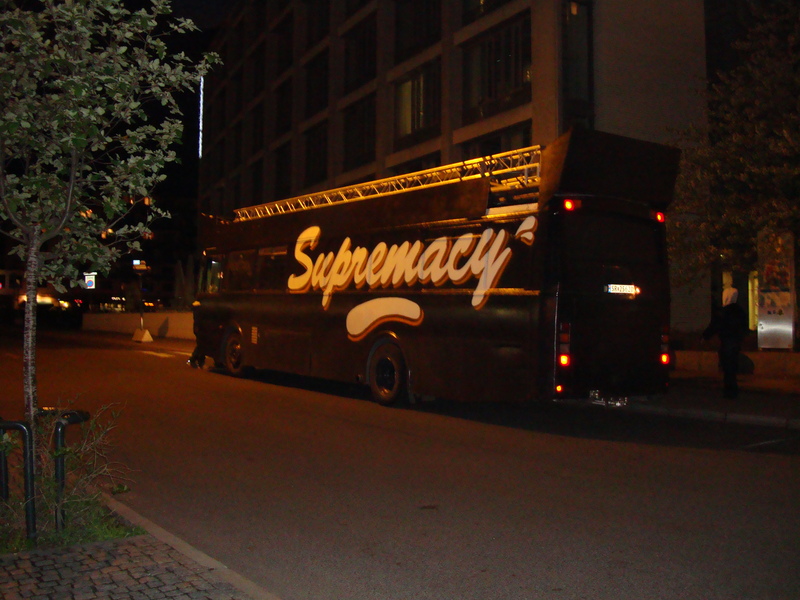 You can see below a couple of pictures of one of the buses. If I get a chance to see the insides of any others, I’ll post more pictures later. There are more traditions associated with this time of year, but I haven’t really heard enough to write about them. Hopefully I will be able to do so sometime next week. I also hope others find this as interesting as I do. As strange as some of this may seem, it’s important to remember that there are traditions that we have in America that are also rather unique. Prom, yearbooks (for the most part), and the walk across a stage to receive their diploma are not something that graduating students usually experience in Norway, so it’s really not surprising that they have developed their own traditions.